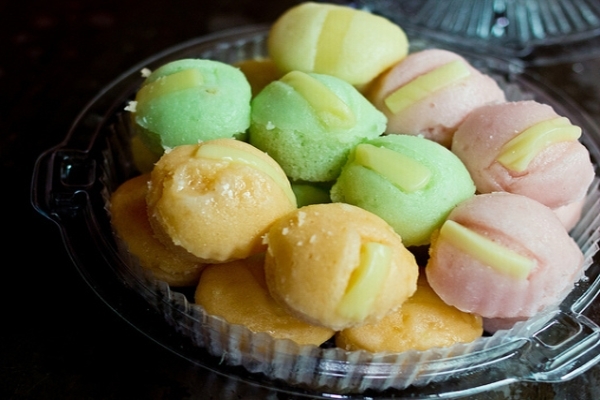 Puto is a steamed rice muffin which is popular as snack or dessert in the Philippines. In its traditional form, puto is of a plain white color. Adding certain common Filipino ingredients like coconut milk, ube and pandan (made from pandan leaves) slightly changes the flavor and completely changes the color of the finished product. Some other variations of steamed rice muffin (Puto) are Puto Bumbong, Puto Calasiao, Puto Lanson, Puto Mamon, Puto Manapla, Puto Maya, Puto-Pao, Puto Seko, Puto ube and a lot more. Making and selling puto and kutsinta are hit business opportunities because (1) they are ridiculously easy to make; (2) they require very little capital; (3) you can mark them up to as high as 300 percent but (4) they will still be affordable to the masses. 1. Sift the rice flour, salt, baking powder and white sugar together. 2. In a bowl, add the coconut milk to the sifted ingredients and blend until the mixture is smooth. 3. Add anise seeds or whatever flavoring you wish (i.e. vanilla, pandan, etc.) Mix and blend thoroughly. 4. Carefully pour the mixture into the muffin pans (greased with butter beforehand), making sure you leave 1/3 space at the top. This is to give the puto space to expand upon cooking. 5. Steam for about 30 minutes. 6. Check for doneness by inserting a toothpick into the center of each puto—the toothpick must come out clean. 7. Top with grated coconuts. Step 1. In a medium mixing bowl, sift all purpose flour, cake flour, baking powder and salt three times. Set aside. Step 2. Beat yolks until lemon colored. Add 1/2 cup sugar gradually and continue beating. Step 3. Fold in flour mixture to egg yolks alternately with water and milk. Add vanilla. Set aside. Step 4. Meanwhile, beat egg whites until soft peaks form. Add 1/4 cup white sugar and continue beating until stiff. Fold in egg batter. Blend well and pour mixture in a 9-inch cake pan. Step 5. Sprinkle grated cheese on top. Cover with cheese cloth. Steam for 30 minutes or until a tester inserted in the center comes out clean. specil putong puti.no need to add water? ill try this and maybe I can add this to my little business..
Iteresting I will try this…..
hmmm…i will try this on sat…. i will try it to..my fave puto.. I love to eat puto.Thanks for sharing this beautuful post.